Even though Reddit rocked a very basic UI for well over a decade, it built a cult following and has driven influential discussions around key issues on the internet, along with those dank memes of course. But, Reddit is now rolling out a refreshing new redesign, which falls more in line with modern standards, and what young internet users expect from social networks such as Reddit. With this fresh new look, it’s no longer the scary old Reddit, but a lot more welcoming for those who stumble in or for new users. 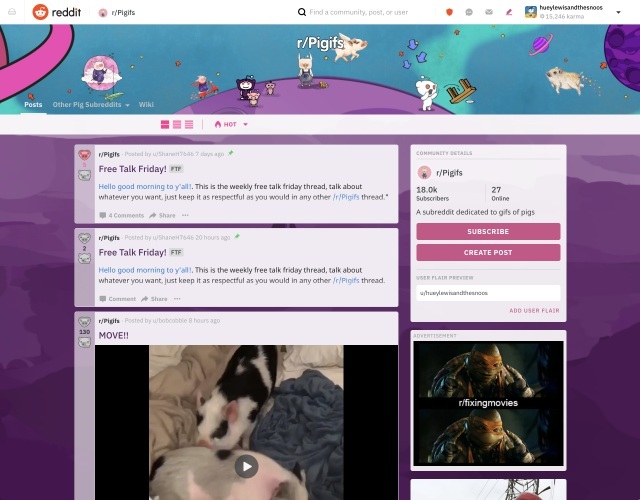 Firstly, Reddit has now revamped the design of its platform. It no longer looks like a ’90s relic, which makes it a lot more approachable for users born in this millenium. You get access to a modern and clean UI on the desktop, making it a lot less intimidating and more intuitive with subreddits neatly displayed on the let=ft. With this redesign, new users won’t be bogged down by a flood of info coming at them at the same time. It better utilises the sidebars to focus on the content and displays links to nearly every feature more clearly. 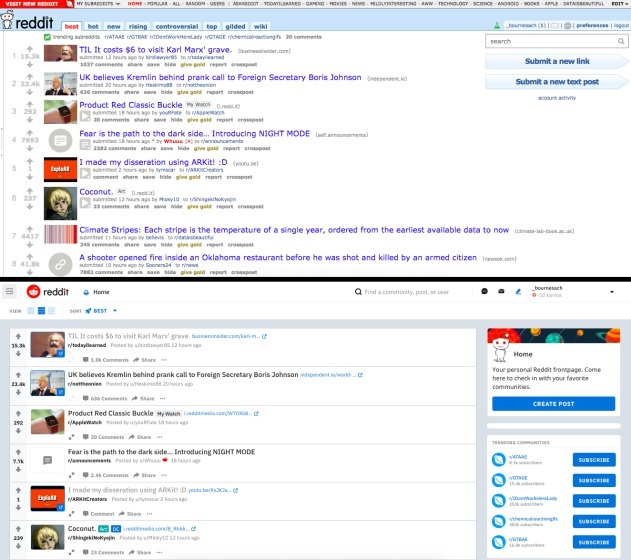 The redesign comes with 3 modes namely compact, classic and card that gives users the option to adjust the viewing experience, which is a great addition, while the font changes will help new Redditors discern between internal and outbound links. Yes, you wouldn’t be lost in la-la-land, frustrated by clicking on the wrong link or post. Reddit has also prominently placed important features such as the ‘subscribe’ or ‘create post’ buttons on subreddits (topic-based community), making them more visible and easily discoverable for new users. The redesign seems to have worked wonders for the front page of the ‘front page of the internet’. The horizontal list of subreddit subscriptions is gone for good, and now subreddits are hidden behind a familiar hamburger menu on the right. Reddit does not want newer users to get confused with a long list of subreddits from the get-go, so it hides away when there’s no interaction with the drawer. The new, big bright ‘create post’ buttons ensure newbies know how to submit new posts, while also seeing suggestions for topics they might be interested in, just like they would on other social media websites. Much like any social network, Reddit has also switched to infinite scrolling to show users more of the content that they love. This means new users will see everything upfront and won’t be at the dearth of content. Reddit used the archaic ‘next’ button for pagination. This means Reddit users won’t have to rely on extensions, such as Reddit Enhancement Suite (RES) to improve the experience. This also ties into the next feature, which is possibly the one of the most important changes that has been introduced in the redesign. Reddit is clearly prioritising discussion over discovery. It has unified the core experience across the board for all subreddits (moderators can still customize the look and feel for the most part) but Reddit doesn’t want new users to stray around too much. Reddit wants you to see the Hot posts which have got the most upvotes in the subreddit. 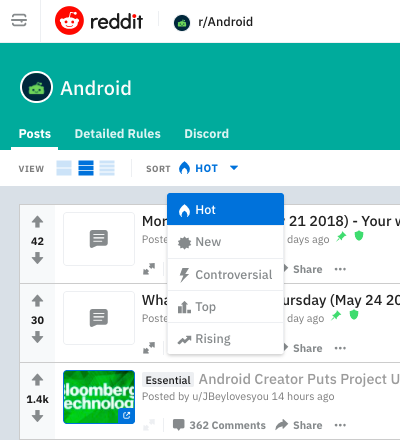 Other sorting options have now been clubbed under a drop-down menu to keep the focus of those users who are unfamiliar with Reddit fixed on the most popular posts. It makes sense because these are more likely to drive discussion among newer users. Reddit is also making it easier for new users to read more, spend more time on the subreddit, instead of playing with sort options such as Rising which limit the number of posts visible. If you’ve ever tried using Reddit, you would know clicking on links in the subreddit opened the links themselves, and you had to specifically click on the comments hyperlink to view the comments. Now with the redesign the posts now open in a lightbox atop the scrollable feed, while submitted links are shown below the headline. Now self and link posts open in a sort of lightbox, where you can see and vote on the comments. Earlier Reddit would only open the self posts, while link posts would directly open the URL they lead to. You can always click on the link directly from the main subreddit page to head there, but the more intuitive action now opens the comments. This means less time on other sites, and more time on Reddit. Reddit has even updated the post creation process, keeping in mind the needs of newly added users. Firstly, I cannot stress enough about how much more visible the ‘create post’ button is, but replacing the markdown post editor with a WYSIWYG (what you see is what you get) editor is a step towards accommodating new users. As you can see in the GIF above, you no longer need to format text and can directly start writing the comment or post – which is certainly a major change. They don’t need to add HTML tags to format text and can do the same with a formatting toolbar. Also, Reddit now allows you to include text and images in a single post instead of linking them to text after you’ve uploaded it to an image sharing platform. You still get three post options, where you can either send a text and image post, only an image or video, or a link to a subreddit. At last, the last thing Reddit wants the new members of its community is to miss out on important discussion and multiple opinions. We have already seen that the company is focused on increasing time spent on the site, which is the reason it seems to have changed how collapsing child comments work. If you’re a new user, you’d be scrolling through a stream of comments without even the slightest hint that you can collapse them. As you see in the screenshot, you need to click on one of the lines of the left – connecting each comment – to collapse the thread of comments. This makes it more likely that new users will read all comments under a parent instead of collapsing ones they are not interested in. Once again, this results in more time spent on Reddit. The good thing is power users will know how to work around some of these changes. And a there are a lot more changes that we haven’t brought up here. What’s clear is that Reddit is keen on making sure newer users don’t walk away from it due to its old UI. It wants them to join in on the discussion, by making it easier to do so, while creating a familiar home for those who found its UI too intimidating to start with. It’s trying to get new die-hard users. And veteran Redditors would know how difficult it is to detach themselves from Reddit once you get hooked.